USPA NEWS - Sotheby's is pleased to open their 2019 Auctions of Contemporary Art with Contemporary Curated on 1 March in New York. Reflecting a Diverse Ensemble of Works from the Post-War and Contemporary Periods, with many Exceptional Highlights appearing at Auction for the First Time, this Season's Offering is accented by an Outstanding Group of Works by African American and Women Artists, with Examples by Olga de Amaral, Louise Bourgeois, Sam Gilliam, Eva Hesse, Yayoi Kusama, Kerry James Marshall and Faith Ringgold, among others. Sotheby's is pleased to open their 2019 Auctions of Contemporary Art with Contemporary Curated on 1 March in New York. Reflecting a Diverse Ensemble of Works from the Post-War and Contemporary Periods, with many Exceptional Highlights appearing at Auction for the First Time, this Season's Offering is accented by an Outstanding Group of Works by African American and Women Artists, with Examples by Olga de Amaral, Louise Bourgeois, Sam Gilliam, Eva Hesse, Yayoi Kusama, Kerry James Marshall and Faith Ringgold, among others. Estimated to achieve more than $22.5 million, the March Auction marks the Highest-Ever Pre-Sale Estimate in the SalesSseries' nearly Six-Year History. Highlights from the Sale include George Condo's Smiling Girl with Black Hair (estimate $1/1.5 million) – a Highly Refined Example of his Ability to manipulate theTtraditional Notions of Portraiture – Sean Scully's Monumental Wall of Light Pink Grey Sky from the Artist's celebrated Wall of Light Series (estimate $800,000/1.2 million); Ad Reinhardt Resplendent No. 12 from 1950 (estimate $600/800,000); and Yayoi Kusama's Dots Obsession from 2005 – a Remarkably Complex Example of the Artist's most Personal and Renowned Body of Work (estimate $450/650,000). Preceding the Bi-Annual Auction is By Women, For Tomorrow's Women – the First-Ever All-Women Artist Benefit Auction at a Major Auction House. Over the Course of Several Months, 40 Pieces by 38 Pioneering Women Artists have been donated to create this Distinct Offering of Modern and Contemporary Works, with Full Proceeds to support FinancialAaid that enables Emerging Female Leaders to attend Miss Porter's School, the Nation's Leading, All-Girls Private Boarding School. The Contemporary Curated Pre-Sale Exhibition opens to the Public this Friday, 22 February, alongside works from By Women, For Tomorrow's Women, and the Contemporary Art Onlineaauctions, open for bidding from 22 February – 8 March. "On the heels of our highest-ever sale total thisppast September, we are thrilled to present the Contemporary Curated Auction this March. Included in the Sale are Several ParadigmSshifting and Groundbreaking, Fresh-To-Market Works by Artists who have played Pivotal Roles in the Contemporary Art Historical Cannon. Some of these Examples include the IntimateCcirca 1945 Alice Neel Portrait Connie, aFformative Painting by Eva Hesse from the late 1950s, a 1970 intricately collaged, Vibrant Romare Bearden entitled The Unforgotten and the Groundbreaking 1974 Slab Painting Special Checking by Jack Whitten, the first from this Series to appear atAauction by the Artist. 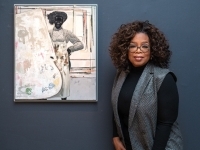 "In addition to these Exceptional Works we are thrilled to offer a Selection Works by theAartists Active today, led by theEexquisitely Painted 2008 Untitled (Painter) by Kerry James Marshall which addresses theTtenets of Race and Representation as well as the Act of Painting and the History of Cultural Production. Many of the Exceptional Works in the Curated Sale are by Artists Historically Underrepresented in the Secondary Market which is a Wonderful Complement to the Charity Component of our Sale Series this Season as we are honored to partner with Miss Porter's School on the By Women, For Tomorrow's Women Auction co-chaired by Agnes Gund and Oprah Winfrey. We are thrilled to be collaborating on the Sale which will raise Money for Financial Aid at the School and know that the Auction will celebrate and promote the Vital Contributions that Female Artists have made, and will continue to make, to Art-Making and to ourCculture at Large." Sotheby's Auctions of Contemporary Art continue with Contemporary Art Online (22 February – 7 March) and a Dedicated Online-Only Sale, The Form of Ideas (22 February – 8 March). Photo Cover : Sotheby’s 2019 Contemporary Art season opens in New York on March 1st with ‘Contemporary Curated’, featuring co-curators Agnes Gund and Oprah Winfrey, pictured here with Kerry James Marshall’s ‘Untitled (Painter)’ from 2008, which is estimated to sell for $1.8/2.5 million. The entire auction is estimated to achieve more than $22.5 million, the highest-ever pre-sale estimate in the series’ nearly six-year history.